Chynna, congrats on getting your very special children's book into print! I know you must be so excited to get your message out there! But please do use the right terminology--it's subsidy publishing, not self-publishing. It may seem like a matter of symantics, but there is a very real and distinct difference. Because of the glut of subsidy publishers hawking their wares all over the internet, it has become increasingly difficult for writers to understand the challenges of using the business model associated with that type of publishing. I wrote a detailed article about it for the July 2007 issue of WOW--The Self-Publishing Travel Guide: Exploring New Territory. Most books intended for the mainstream can not become viably successful for the subsidy published author because of the financial structure of that publishing model. I won't go into it here--the details are in the 15 page article. That being said, your book may prove to be an exception because of its specialized niche. You'll need to market the bejeebers out of it through organizations and groups made up of SID families. I know for you this is a special labor of love and it's important to get the message out for families and children of SIDs, so making a profit is not the main goal. But for most authors, subsidy publishing will be a very unsatisfying financial situation. And to all you readers out there, I had a chance to preview Chynna's book, and it's wonderful! It's a much needed book and will be a super help to kids, parents, and friends of children with SIDs. Before you told me about Jaimie I had no idea what SIDs was, so I know your book will bring a lot of understanding into this world. :-) Kudos and congrats to you for making this happen! And on Outskirts -- I know several people over there from emailing back and forth over time and them sending me review copies, and I have to say that they're definitely one of the most reputable subsidy publishers. They have a nice staff and work closely with their authors. I think that as long as an author knows what she's getting and decides to go that route, there's nothing wrong with going with a subsidy publisher. And for your book, I think it was a wise decision. Thanks for sharing your experience, love! Thanks for letting me post about my project. Did I sound too harsh in my first comment? I hope not! Chynna, I truly think it's awesome that you've gotten your daughter's story and the SIDs information out there. I had never heard about SIDs either, until I read your incredible inspirational story in this month's issue of WOW. I think having a resource like your book will greatly help families who have faced the same challenges and it will help educate the rest of us! I agree with Angela, there is definitely nothing wrong with using a subsidy publisher if that business model works for an author. We all have our own writing and publishing journeys. And fortunately, now with all of the wonderful opportunities and new publishing technology, writers have more choices than ever before. I've done a lot of research about the intricacies of alternate publishing models over the last two years, and for a brief period of time, considered using a subsidy publisher myself. But that model wouldn't work well for a book like mine. That's what it's all about--women writers helping women writers. OHHHHHHH Annette....it's okay! I knew what you meant and you're right--there are differences among the various publishing routes writers should know about! Thank you so much for your support too, Annette. I really appreciate it. Now off to read your article again...I think we need more info on here about venture publishing too. I think I know of a publisher that does that through querying and stuff. Ok, someone smack me with my own terminology whip for my lazy publishing lexicon. I darn well better practice what I preach! It's TECHNICALLY called "Joint Venture" publishing. LOL I didn't notice my lax usage until I saw you repeat it! So, if I'm going to prance around like a pain-in-the-posterior know-it-all, I sure as heck better work on my computer-side manner and be accurate in what I say! To expand on Annette's idea of marketing... I think your book would be perfect to sell to libraries. Did you ever read Patricia Fry's article "How to Tap into the Lucrative Library Market"? Chynna, your book will need Library of Congress CIP data or at least a LCCN (Library of Congress Control Number) to get into the libraries. Chynna, I read your book, and I've already told you what I think. Your book will give other children and parents great insight into an illness most people probably know nothing or very little about. 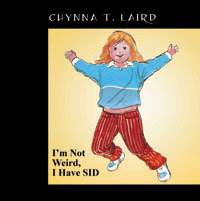 It doesn't matter if it's an adult or a child who needs to learn about SID. It applies to people of all ages. Your book will open a window to the reality that you face each day. Plus, kids are amazing creatures. When they know a friend has a "situation," an illness, or a disease, kids can be more compassionate than anyone. Yes, kids can be mean, but most of the kids I've worked with over the years use their hearts to help classmates and others, especially when they understand what someone is going through. Your book will open a window of compassion for many people who need to know about SID. What a fabulous project!! Thanks!